This incredible Joaquim Tenreiro sideboard possesses an incredibly vivid detail to the book-matched Brazilian Jacaranda rosewood grain. Designed and crafted in the mid to late 1950s, this piece still retains its original maker labels on the rear side. Incredible design with five top drawers in signature Joaquim Tenreiro style cantilever out slightly and function as clever handles, and five cabinet doors with open space inside. Simple and modern handles and hardware accentuate this amazing credenza. Note: This design matches Joaquim Tenreiro designs however we are not yet certain therefore we are listing this as Attributed-To Tenreiro and is priced accordingly. 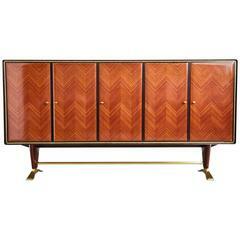 The price would be double once this is confirmed as a Tenreiro sideboard. This piece was just sourced from a home in Rio De Janeiro and recently shipped to here to the US by our team. This sizable and vivid cabinet is outstanding and can either command center stage in a room or work in harmony with other prime examples of design. Would pair incredibly with a dining table and chairs by Scapinelli, Tenreiro, Zalszupin or Sergio Rodrigues. We have a full selection of Brazilian Modern, contact us for more details. In very good original vintage condition, ready to be used immediately. Sturdy and structurally sound. Measurements: H 33 x W 98 x D 20. In very good original vintage condition, ready to be used immediately. Sturdy and structurally sound. Harold Schwartz, Romweber Furniture Co.